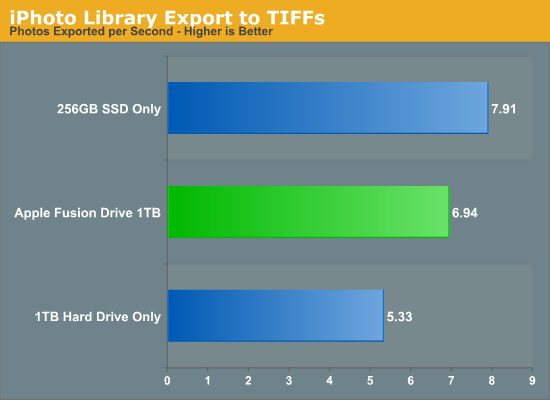 Benchmarking Fusion Drive is a bit of a challenge since it prioritizes the SSD for all incoming writes. If you don’t fill the Fusion Drive up, you can write tons of data to the drive and it’ll all hit the SSD. If you do fill the drive up and test with a dataset < 4GB, then you’ll once again just measure SSD performance. The breakdown accurately sums up my Fusion Drive experience: nearly half-way between a hard drive and a pure SSD configuration. In this particular test the gains don't appear all that dramatic, but again that's mostly because we're looking at relatively low queue depth sequential transfers. The FD/HDD gap would grow for less sequential workloads. Unfortunately, I couldn't find a good application use case to generate 4GB+ of pseudo-random data in a repeatable enough fashion to benchmark. If I hammered on the Fusion Drive enough, with constant very large sequential writes (up to 260GB for a single file) I could back the drive into a corner where it would no longer migrate data to the SSD without a reboot (woohoo, I sort of broke it!). I suspect this is a bug that isn't triggered through normal automated testing (for obvious reasons), but it did create an interesting situation that I could exploit for testing purposes. Apple's Fusion Drive is very aggressive at writing to the SSD, however the more data you have the more conservative the algorithm seems to become. 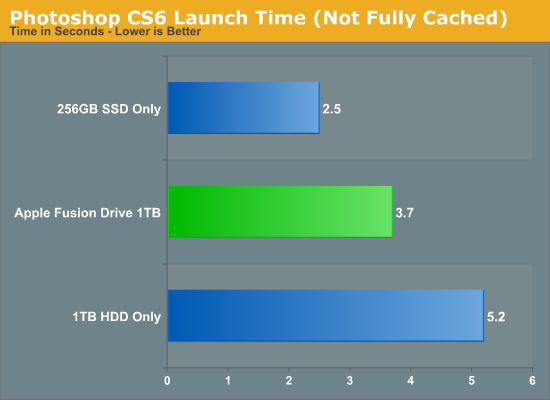 This isn't really shocking, but it's worth pointing out that at a lower total drive utilization the SSD became home to virtually everything I needed, but as soon as my application needs outgrew what FD could easily accommodate the platform became a lot pickier about what would get moved onto the SSD. This is very important to keep in mind. If 128GB of storage isn’t enough for all of your frequently used applications, data and OS to begin with, you’re going to have a distinctly more HDD-like experience with Fusion Drive. To simulate/prove this I took my 200GB+ MacBook Pro image and moved it over to the iMac. Note that most of this 200GB was applications and data that I actually used regularly. By the end of my testing experience, I was firmly in the category where I needed more solid state storage. Spotlight searches took longer than on a pure SSD configuration, not all application launches were instant, adding photos to iPhoto from Safari took longer, etc... Fusion Drive may be good, but it's not magic. If you realistically need more than 128GB of solid state storage, Fusion Drive isn't for you. I purchased a mid range mini a Qaud 2.3 with just a 1tb hdd. I added a samsung 830 512gb ssd as the second drive. If you put the ssd in with no format and boot with an external drive you then go to disk utility the internal ssd and internal hdd are highlighted in red. The disk utility sees it as a broken fusion answer yes to fix it and in under a minute you have a 1.5tb fusion. then do an internet recovery to load mountain lion and you have a standalone mac mini with a killer 1.5tb fusion. Everything you mention in your tests(about the ssd being taxed) is less true basically because the ssd is huge and in a 1 to 2 ratio with the hdd. This is the closest I have come to a 1.5 tb ssd.